This was my third consecutive Brecon Beacons Ultra, a 46 mile race comprising two loops around and over the Brecon Beacons starting and finishing at Talybont-on-Usk. The race is run by Likeys. Martin and Sue Like are an amazing couple who pull out all the stops to make the race enjoyable for everyone. This year the race filled in under 48 hours which is testament to it’s popularity. Once again I was looking forward to racing against some good ultra runners and test myself over a technical and demanding course. Mark Palmer was back again, hoping to make it five wins in a row. Mark is a bit of a legend when it comes to hilly trail racing, especially after his awsome sub15 hour Bob Graham Round last year, probably one of the fastest times in it’s history. I came second to him in the previous two races. If I was going to get any closer to him this year then I had improve my hill running form. I’d done a little more specific training this year, although living in Teddington beside the Thames is not the best base for any hill training! We were fortunate to have four teams entered into the race, under the supplement company Elagen. They were good enough to once again provide Elagen Sport and Beta Alanine pills in the lead-up to the race, which we believed helped preparation and execution. I formed a team with Andy and James, who are both great ultra runners. I woke up shortly before 4am on Saturday morning feeling reasonably fit and ready to race. Obviously an early rise on a cold (3c) and misty morning is never going to be easy but hey this was the same for all of us, so no complaining. I could go into details about my pre-race preparation and rituals including gear selection (and weigh ins! ), nutrition, etc but will leave that for another blog. My breakfast was relatively light and I had a couple of coffees to wake myself, and once Andy dropped by we drove the 1hr15 from Tenbury to Talybont. The race venue was in the town hall and when we arrived the atmosphere was already buzzing. A number of the Elagen squad had already turned up and after the race brief we all headed towards the start line on the canal ready for the off at 7:30am. Because of the rain in previous weeks we were expecting a lot of mud and rain water out on the course. The ash tree disease had also meant a diversion was made to the course. It was only an extra 800m on each lap but involved a drop down a hill and back up again. Arguably slower times this year. At the start I tucked in behind a group of runners. James and Richard Webster headed off on what appeared just under 7:00/Mile, so I decided to bridge the gap and tuck in behind them. I wouldn’t have done this if I didn’t feel comfortable. I also wanted to try and get a lead by the start of Tor Y Foel (the first and toughest climb on the course), and hopefully be near the front by the summit. Unfortunately I managed to key-lock my Garmin watch, and spent the first 6mins running along the canal trying to find the two key combination (of six) to unlock it again. I like looking at the Garmin watch while racing, the data helps to take my mind off the pain! The first 3 miles of the loop run along the canal between Talybont and Llangynidr, before we head up on to the fields and the start of a two mile climb up to the top of Tor Y Foel at 550m. James and I stayed together for the first half of the climb, impressive considering he’d done the Ballbuster the week before. This year I amazed myself as I not only ran the whole way up but I felt ok off the summit and went straight into a fast descent down the other side. Perhaps a little too exuberant as I ran straight into the bog at the bottom and almost slid on my arse. I kept the pace up to the first aid station at circa 6 miles. According to my Garmin watch I was a couple of minutes up on my 2011 race at the same point. I filled up my bottle at the aid station and didn’t waste any time running down the rocky and wet track at pace and the start of the smoother path up the Taff Trail. I kept to a 7:30/M pace for this 2-3 mile section, with the odd glance back to see what my lead was. Mark was around 1:30-2:00 behind and apparently this continued for the rest of the first lap. After passing over a cattle-grid and out of the wooded area you hit a one mile section of road that takes you up and then back downhill to the start of Taf Fechan Forest. This was the point at which the race course took a diversion because of the ash tree disease. 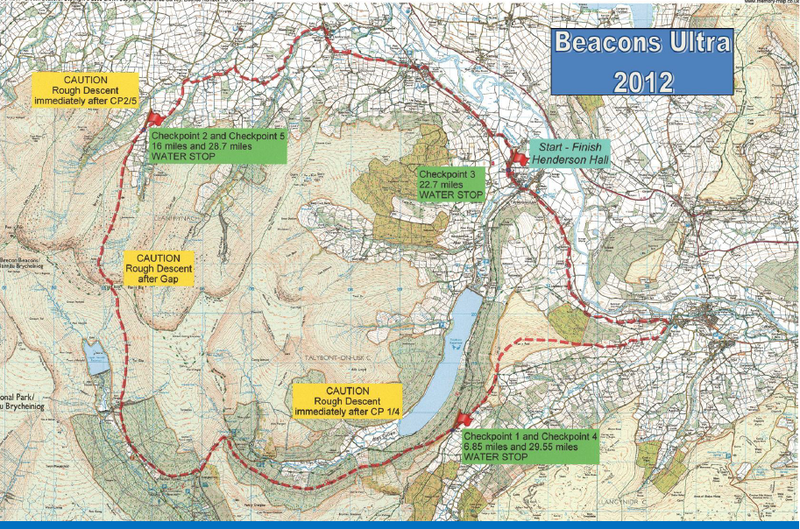 The run downhill was fine, but the Fechan uphill to follow wasn’t, particularly on the second lap. I noticed on my watch tracker that I’d lost around 3-4mins to last year on this diversion, and around 5mins on the second lap. 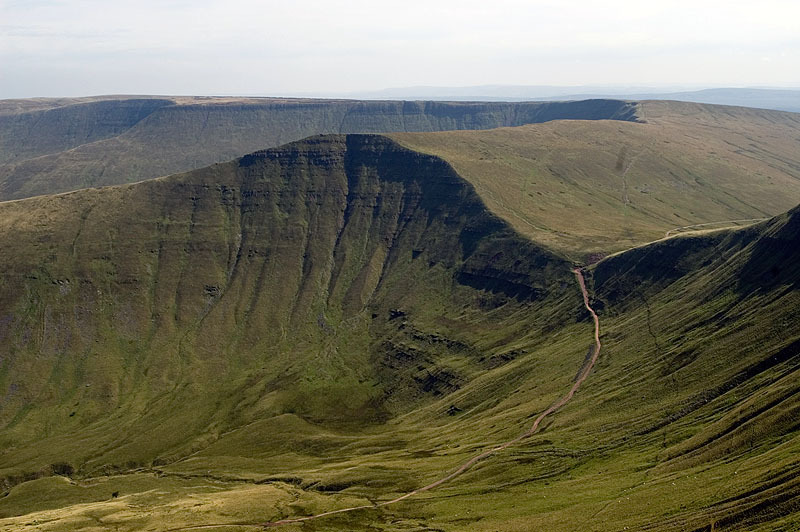 Back on to the Taff trail and the long, rocky ascent to ‘The Gap’ (600m) – the highest point on the course and pass between Cribyn and Fan Y Big summits. As I started up this section a bunch of laiden soldiers ran down the trail towards me. The leader shouted “single file!”, and the rest obliged (the following day my uncle told me I should have shouted “Royal Navy!” as I ran past). At that point I was reminded of a cousin who died in the Falklands war 30 years ago, and it inspired me. But rather than dig deeper and run faster, something told me to back-off. I started to relax and concentrate more on my form. I generally felt very strong during that first lap. I flew down the other side of the hill/mountain towards aid station 2 at the 17 mile mark. Once again I picked the pace up and ran as hard as I could, taking a few risks through stoney trenches. Just one ankle wobble during the whole race and no trips, so it paid off. The final six miles of the loop are a mix of road, fields, track and a final two mile slog back along the canal from Pencelli to Talybont. It was quite muddy on the off-road sections but I was confident with my shoe/sock choice so ploughed straight through. Sue Like and race team were waiting at the end of the lap, perhaps a little surprised I was in the lead. A fine selection of gels, but I was happy with my lot so topped-up with water and was off on the second lap. I’d finished the first lap in 3hr3min, only a min faster than last year but with harder conditions and a diversion I was going strong. Continuing along the canal I kept pushing the pace, as I knew my lead was short. Once on the Tor Y Foel climb I could see Mark behind me, obviously looking a lot closer at just 2mins according to my time-checks. This was the toughest part of the race for me. I had to dig deep to try and hold that gap. I was several mins slower than the first lap as I had to introduce some strides and push down on the knees during the steeper sections near the top. Amazingly I was still holding that gap and perhaps had extended it a little by the summit. This time my legs were shot, but I used the downhill to recover myself and jogged along the track to aid station 4 at the 30 mile mark. I was a lot slower on the second loop. Even the flatter sections were 30secs/mile slower, and that was as hard as I could safely push myself without crashing. 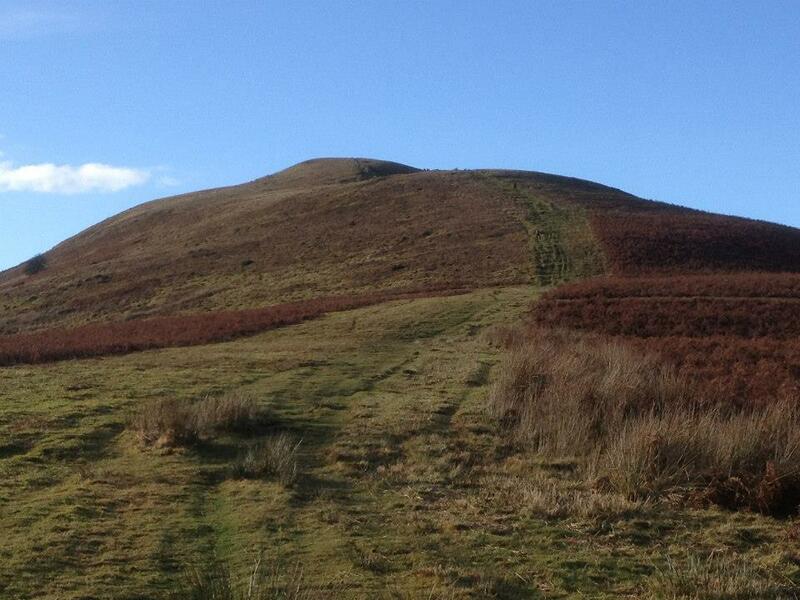 The long climb up to The Gap felt extremely sluggish and the mile splits proved it. I kept taking breathers and looking over my shoulder for approaching runners. I knew that once I reached the Gap it would get a lot easier. My feet and legs were numb and I was less agile skipping over the stones and rocks on the descent, but in just over an hour I would be finished! The fields over the final five miles were a quagmire in parts, but I didn’t mind getting covered in mud so ran straight through as if I was in a xc race. A few more checks on the road and I saw no-one but I didn’t want to take it for granted. Who knows, some young whipper-snapper might still come galloping around the corner. This happened at North Downs Way 50, and I wasn’t going to let it happen again. Keep pushing it. It wasn’t until the approach to the final bridge turning off the canal with 400m to go that I knew I’d done it. The relief crossing the finish line was immense. I’d completed the 46-47 miles in 6hr34mins. It was a great way to end the season, particularly after the last three months! Its just what I needed to get my enthusiasm for the sport back again. Andy had a problem with one of his knees but still finished 8th, and James came in not far behind. That gave us the team win. We had a 6th from one of the other Elagen teams and it was fun watching everyone else finish. I’m looking forward to returning next year, a great race.